The Kiev, Svyatoshinskiy region, Squirrel, str. 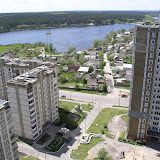 Obuhovskaya 135. The Beaches, lake, coniferous wood and fresh air — all this does «LAKE» attractive for buying in him apartments and further of the residence.